14k white gold and 0.5500ct of diamonds disk pendant. 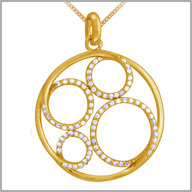 Create a luminous style of dazzling diamonds with this pendant. It is made with polished 14K white gold and features 79 round full cut diamonds bead set in four cirlces inside round disk design pendant. The total diamond weight is approximately 0.5500ct (color: G-H, clarity: SI). It measures 1-1/8" x 1-1/8" (width of 1/16") and comes with a 18"L chain..